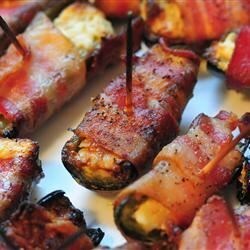 "This recipe came about after years of competition with family and friends over the perfect stuffed jalapeno. Bring your tissues because these are HOT! Goes well with Summer Beer I from this site." Fill the jalapeno peppers with cream cheese. Sprinkle the Cajun seasoning on top, then wrap each stuffed jalapeno with a slice of bacon. Secure with a toothpick. Arrange the wrapped jalapeno peppers in a single layer, face down on a broiler rack. What's cooking in Fort Worth? Delicious stuffed-jalapeño poppers, of course.